Win a Family Pass to PJ Masks LIVE! Time to Be a Hero in Melbourne. 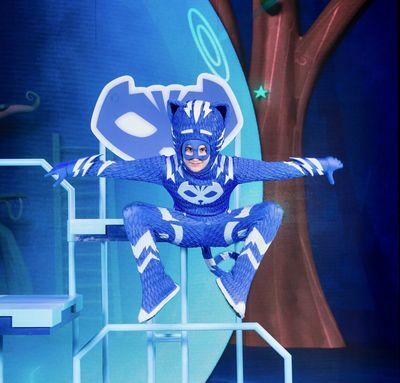 Yes that's right little PJ Masks fans.. Catboy, Owlette and Gekko will hit the Australian stage for the very first time this Spring in an all new live action theatrical experience: PJ Masks LIVE! Time to Be a Hero. This exciting on-stage adventure follows Connor, Amaya and Greg who (as we're sure you already know) don their colourful pyjamas, activate their animal amulets and turn into their alter egos - Catboy, Owlette and Gekko! Take your children to see their favourite pyjama heroes at Margaret Court Arena on Saturday 13 and Sunday 14 October 2018 at 10am, 1:30pm & 4:30pm. Read more information about the PJ Masks LIVE! Time to Be a Hero Australian tour here. 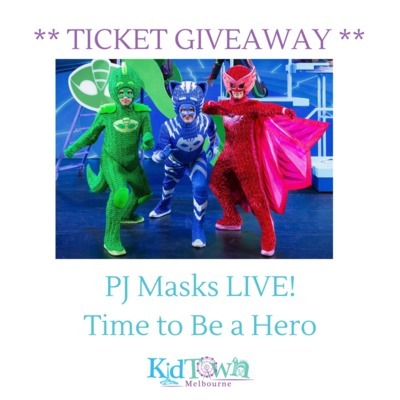 We are very excited offer one KidTown Melbourne reader the chance to win a Family Pass to see PJ Masks LIVE! Time to Be a Hero at the Margaret Court Arena this October. To enter, like this post and leave a comment on Facebook telling us why you'd like to win. The competition will remain open until 9pm, Wednesday 25 July AEST. The winner will be selected at random and announced on Facebook. Please note: the exact show date and time will be allocated once the winner is drawn.